In its latest report, the IMF expects the economy to grow by around 1.5 percent in 2018 and 2019 if a broad Brexit agreement is struck, compared to 1.75 if it had remained in the bloc. But Managing Director Christine Lagarde warned failure to strike a deal would lead to contraction. She said as the IMF presented its annual report on Britain’s economy: “A more disruptive departure will have a much worse outcome. “Let me be clear, compared with today’s smooth single market, all the likely Brexit scenarios will have costs for the economy and to a lesser extent as well for the EU. 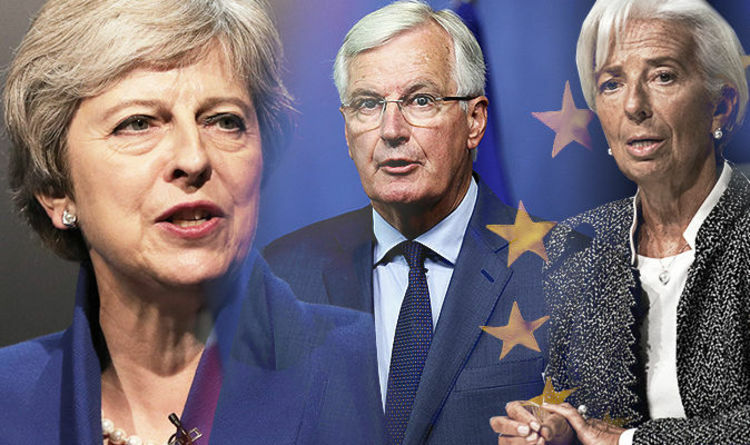 The IMF added there was a “daunting” range of issues still to be resolved before Britain leaves the EU on March 29, 2019. Speaking alongside Ms Lagarde, Chancellor Philip Hammond said the Government must heed the “clear warnings” from the IMF of a no-deal Brexit. See below for our rolling coverage of Brexit news throughout the day. Austrian Chancellor Sebastian Kurz has said that EU partners must do everything in their power to avoid a hard Brexit. Mr Kurz was speaking to reporters in Paris, where he is meeting French President Emmanuel Macron. The International Monetary Fund (IMF) has warned that leaving the EU without a Brexit deal will shrink Britain’s economy and inflict “substantial costs”. Michel Barnier will meet with Spanish Prime Minister Pedro Sanchez in Madrid on Monday to discuss tge future of Gibraltar as part of a meeting outlining Brexit negotiations. The EU’s chief Brexit negotiator is also meeting with Spanish Foreign minister Josep Borrell. British territory Gibraltar is also due to leave the EU on March 29, 2019. Former Shadow Minister Sir Bernard Jenkin has claimed the boss of Jaguar Land Rover of “making it up” when he warned that a hard Brexit would damage its profits and cost tens of thousands of jobs. The Tory Brexiteer accused Professor Dr Ralf Speth of scaremongering over a prediction that leaving the EU would have a “horrifying” impact on the firm’s business. He had told the UK’s first Zero Emission Vehicle Summit – attended by Theresa May – that a hard Brexit could result in the “worst of times” for the UK while the cost of Jaguar Land Rover would be more than £1.2bn a year. But speaking to BBC Radio 4’s Today programme, Sir Bernard hit back: “I’m afraid I think he’s making it up. Nearly eight in ten voters (79 percent) believe Brexit negotiations have been handled badly by the Government, a new poll has found. This is according to a ComRes survey for BBC Radio 5 Live, which interviewed 1,002 adults in the UK via telephone between September 6 and 9. It showed 41 percent think exiting the bloc will have a positive impact compared to 50 percent it won’t. Just undr a third (32 percent) think their household will be better off in 2023 but 54 percent disagree. Boris Johnson has claimed that if Brexit negotiations over the Irish border continue in their current manner, it will end in a “spectacular political car crash”. The former Foreign Secretary said Britain is heading full speed towards a total write off if the Prime Minister continues with her plans for the Irish border. According to Mr Johnson, the backstop deadlock is being used to force the UK into becoming a vessel state. He said the EU’s fallback position for the Irish border would mean Northern Ireland was “annexed” by Brussels. Mr Johnson added that plans set out by Mrs May would “effectively” see Britain remain in the bloc. The British Chambers of Commerce has downgraded its forecast for economic growth for this year to 1.1 percent, down from 1.4 percent in 2019. According to the BCC, by 2020, the UK economy will have suffered its second weakest decade of average economic growth on record. It said in its report the high cost of doing business in the UK and ongoing uncertainty over the future relationship with the EU will likely continue to stem business investment. The BCC added businesses will contiue to face “significant” skills gaps whoch will undermiine their potential to grow, while workers are unlikely to experience meaningful real wage growth as the gap between pay and price growth is forecast to remain negligible. The EU is prepared to accept a frictionless Irish border after Brexit, increasing the prospect of Theresa May striking a deal over the coming weeks. According to The Times, Brussels negotiators want to use technological solutions to minimise customs checks between Northern Ireland and the Irish Republic. The EU plan would enable goods to be tracked using barcodes on shipping containers under “trusted trader” schemes administered y registered companies, removing the need for new border infrastructure. Michel Barnier is working on a new “protocol” text outlining a plan to use technology to minimise these checks, with the proposals being circulated to European governments after the Conservative party conference on October 3. Theresa May has said that MPs will have a choice between her proposed Brexit deal with the EU – or risk tumbling out of the bloc without any agreement at all. In an interview with BBC’s Panorama, she also criticised plans from Brexiteers to resolve the Irish border issue. But Boris Johnson claimed the Government’s failure to find a solution to this stumbling block has led to a “constitutional abomination”. Writing in Monday’s Daily Telegraph, the Former Foreign Secretary criticised the Prime Minister’s plan to leave the EU, and says her Chequers plan “would mean for the first time since 1066 our leaders were deliberately acquiescing in foreign rule”. Britain and the EU will unveil a Brexit deal in at a special summit in Brussels in November. This is according to Politico which said that one presented, the agreement would be quickly approved by EU 27 members. The final part of the deal is focusing on the “political declaration”, which outlines the framework of the relationship that will accompany the withdrawal treaty. On Thursday, Mr Barnier will brief EU leaders at an informal summit in Salzburg, Austria where the political declaration will be discussed in detail for the first time. Theresa May would still need to get the agreed deal passed through Parliament but Brussels is concerned that nay more challenges from her opponents could trigger a general election or second Brexit vote.